The November elections have had a significant impact on the financial markets. It is important to watch how policies from the new administration unfold. We don’t expect new policies to rapidly accelerate economic growth. However, we do expect growth to improve modestly in 2017. Our equity allocations are entirely domestic. We shift allocations toward large caps for conservative investors, while focusing more on small and mid-caps for aggressive investors. We shorten the average maturity of bond allocations, recognizing tighter Fed policy and the potential for higher inflation. Our growth/value style bias shifts in favor of value at 30/70. Since November, the outcome of the elections has dominated the market narrative. Equity markets rallied sharply, while bonds declined, reflecting a shift in expectations for higher economic and earnings growth, along with rising inflation and tighter Fed policy. Seemingly, the new expectations reflect a lot of optimism for the new president. The thing is, the elephant in the room isn’t really an elephant…at least not a traditional one. Trump made his way into the White House campaigning on positions contrary to several long-standing Republican policies. So, as we begin life under this new administration, we’ll be keeping a close eye on its policies. We’ll be watching to see if Trump tacks toward Republican supply-side views, or if he instead hews to populist priorities. A supply-side approach would focus on making capital more available and more easily invested. Policies would include lower taxes and less regulation, with the belief that rising capital efficiency would stimulate the economy. Theoretically, companies would hire more workers and increase long-term investments. Some of Trump’s cabinet selections indicate this may be the direction he is headed toward. On the other hand, Trump’s vocal opposition to the current state of global trade hearkens to a populist view, one contrary to decades of establishment policy. Here the expectation is for “level” global trade agreements to bring jobs back to the United States and increase wages, which would stimulate economic growth. Early jawboning indicates this may be the new policy direction. Of course, it’s possible we see a combination of supply-side and populist policies. Unfortunately, we don’t expect either strategy to create significant job or wage growth. Technology and innovation appear to be at the root of limited labor opportunities, and both will probably play a role in disappointing some optimists. But even as we don’t expect a big uplift in growth, we do believe there’s room for some improvement in 2017. The economy has maintained a fairly steady, albeit below-average, growth rate, even as the Fed has moved through two rate increases. We believe this trend should continue with modest acceleration, unless the Fed becomes too aggressive. 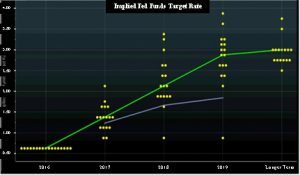 What do we expect from the Fed? Right now, Fed guidance indicates three rate hikes in 2017. Up until recently, the financial markets have been at odds with the Fed’s guidance, having expected a more moderate pace of tightening. For the most part, markets have been correct. But as we look forward, market expectations are now quite closely aligned with the Fed’s guidance. 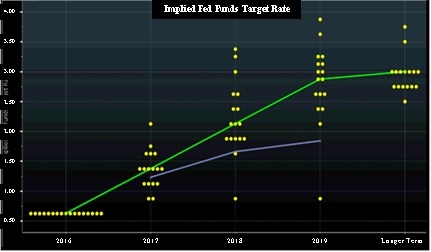 In this chart, the green line represents the median forecast for short-term rates by the Fed’s voting policy members for the next few years, while the blue line illustrates the market’s expectations. We can see the market has generally accepted the Fed’s guidance. Will three rate hikes be too much for the economy in 2017? At this point, we don’t think so. However, even the Fed has communicated the importance of evaluating developing economic conditions as it directs monetary policy. We are optimistic the Fed can make the appropriate adjustments, even as we’re aware of the Fed’s proclivity to overtighten. Given the importance of the Fed’s policy decisions, the real elephant in the room may actually turn out to be the Fed. Equities performed well in 2016, although most of the returns were earned after the November elections. The surge reflects widespread optimism for higher economic growth and rising corporate earnings. Although we see a pathway for both, we expect equity investors are likely to encounter periods of disappointment along the way. Valuations have risen ahead of actual results, meaning delays and shortfalls could increase downside risk. Still, we expect a generally good environment for stocks. Small and mid-cap stocks performed particularly well in 2016, and all of the portfolios benefited from their inclusion. We continue to hold a favorable view toward small and mid-sized companies, which may benefit as Washington policies become more inwardly focused on the U.S. economy. However, with the recent strong performance of small and mid-caps, we are shifting some equity allocations toward large caps for conservative and income-oriented investors, and toward mid-caps in our more aggressive portfolios. Large caps tend to have lower relative volatility and we expect this asset class to also perform reasonably well. Within large caps we favor the energy, financial, industrial and utility sectors, while we are underweight technology and telecom. Sector preferences incorporate our views toward valuations, industry fundamentals and potential changes in regulations. Our growth/value style bias shifts in favor of value at 30/70. We continue to avoid foreign developed equities. Their valuations may be attractive, and many foreign economies should benefit from a stronger U.S. dollar; however, the strong dollar may also diminish returns on foreign investments for U.S. investors. Risk in emerging markets could also increase. For these reasons, we eliminate our emerging allocations this quarter and have no foreign equity allocations in the portfolios. Optimism in the equity markets following the elections was mirrored with pessimism in the debt markets. Expectations for higher economic growth benefited equities but also created expectations for tighter monetary policy, which helped move bonds lower. Adding to negative sentiment has been the prospect for rising longer term inflation, which could emerge if global trade declines. For quite some time, we have included long maturity bonds in portfolios. This allocation not only contributed to income and returns, but it also provided significant diversification benefits. But as we look forward, we may be at the point where a multi-decade decline in rates may be turning around. If we are in a reversal, we don’t expect a rapid increase. Still, we believe it’s prudent to pare back some of the long-term bond allocation this quarter. We continue to favor corporate bonds, including both investment and speculative grades, as we expect relatively low default rates. Even with an increase in longer term rates, we believe real estate can continue to perform well. Financing costs remain relatively low, while occupancy and rental rates are constructive. In addition, real estate rental rates often scale with inflation, providing a mechanism to help maintain income should inflation arise. With the modest pullback in the second half of 2016, we believe real estate is attractive, particularly where income is an objective. Commodity prices could rise with faster U.S. growth, and this asset class may be helpful if we experience rising inflation. However at this point in the cycle, we believe other asset classes offer a more attractive return/risk profile. This quarter we exit the gold allocation, which was useful in addressing global central bank policies; however, our expectation for a strengthening U.S. dollar now makes gold relatively less attractive.